Below are the details of the different decorations we had put up. 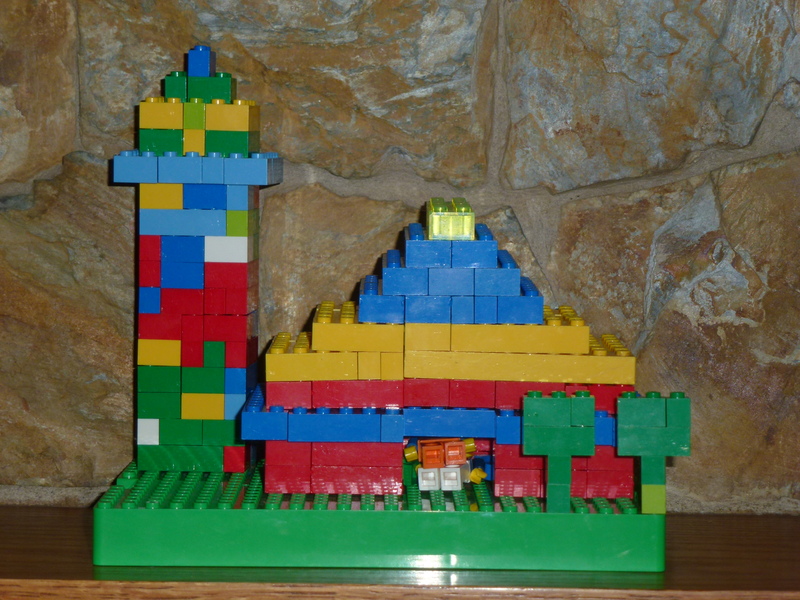 Ibraheem (8) made this mosque out of Lego blocks to be put on the mantel. This started out as our good deed tree for this Ramadhan. The instructions for this project is here. The end result was a pretty topiary to be displayed on Eid day. The children we proud of themselves that the tree got filled up with flowers. This started off as an advent calendar for Ilyaas(4) and Zakariyya (2). The instructions for this is here. After 60 Hershey Kisses, 25 more cloth peg and some painted wooden letters to spell out Eid Mubarak, and Masha-Allah we had an Eid wreath. We added more peg just to give a more filled up look. I think spacing out the pegs will work too. In total we had 85 pegs. This is a great project that Ilyaas(4) and Ibraheem (8) worked on. We used short popsicle sticks for this project. And the way I explained it to Ilyaas (4) was that he had to make letter “V”s. Every time he made five “V”s, Ibraheem (8) helped him stick them all to form a star. We used tacky glue for this as the regular white glue just was not drying up quick enough for a preschooler to lift the stars and toss them around! We then smeared glitter glue on the stars and decorated them with some stick on jewels. 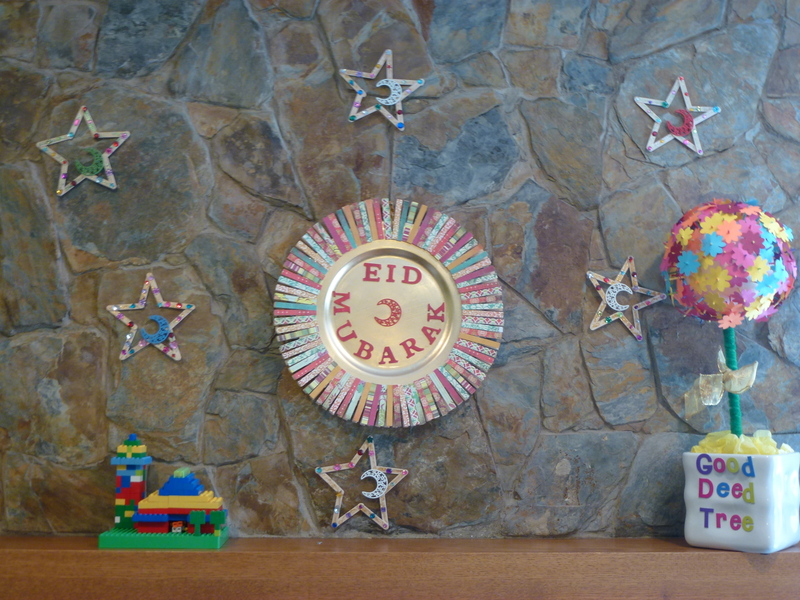 I also used a crescent moon wooden shape to add a little more Eid detail to the stars. This is wonderful, you guys are so talented mashaAllah. A good activities for Eid Ul Fitr. Your kids are smart. I am a homeschool boy from Malaysia. Please visit my homeschool blog. May Allah bless you and your family. These are great ideas! Very creative & pretty. I was looking for ideas to do at “Holiday Week” at my daughter’s elementary school & was really wanting something that would not just turn out pretty but that showed some of the symbols of Islam. I think the Popsicle moon & star craft is perfect. 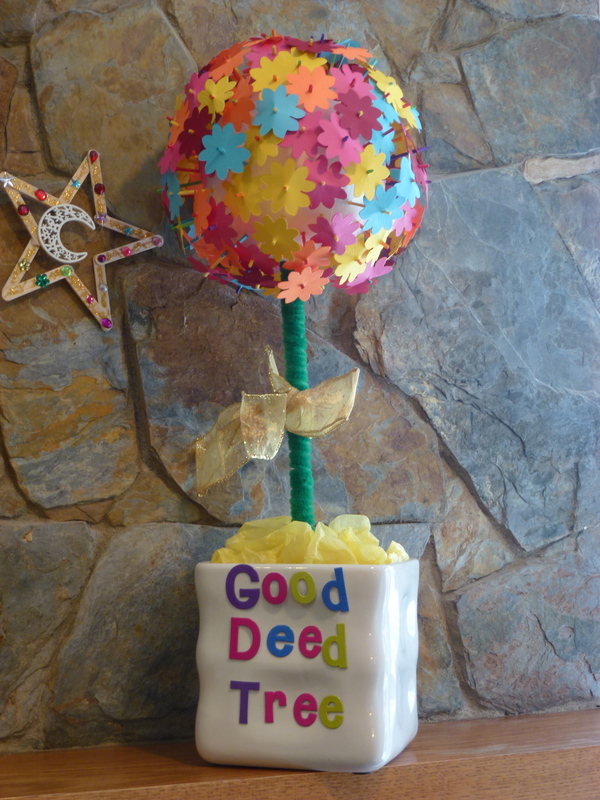 Love the good deeds tree for Ramzan as well! Would be such a lovely tradition around Eid time that holds meaning. Alhamdulillah I’m glad these ideas are helpful for your Holiday Week. Please share pictures Insha-Allah. Btw I love the wooden crescents. Can I ask where you got them from? I always have a tough time finding moon shaped cut outs. 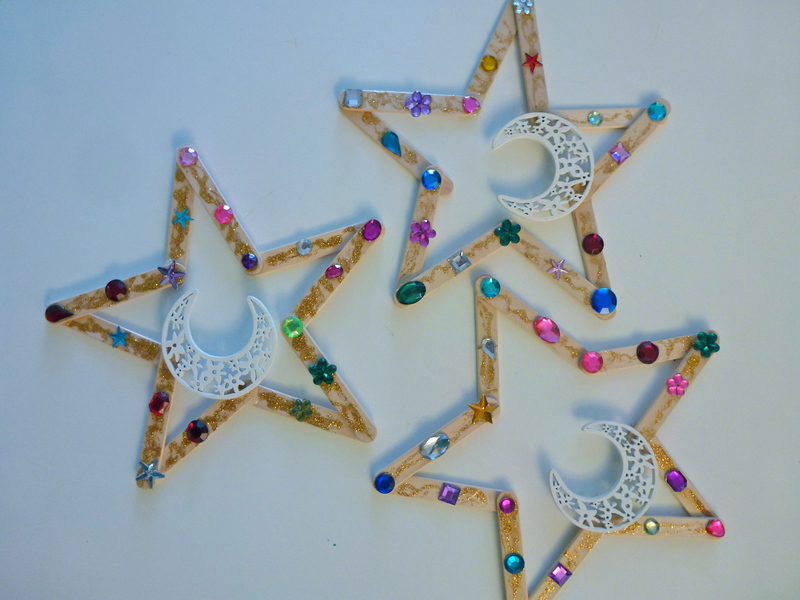 I finally found a moon & stars punch but these wooden shapes are lovely. Please check your email. I have sent you the link where you can find these charms. 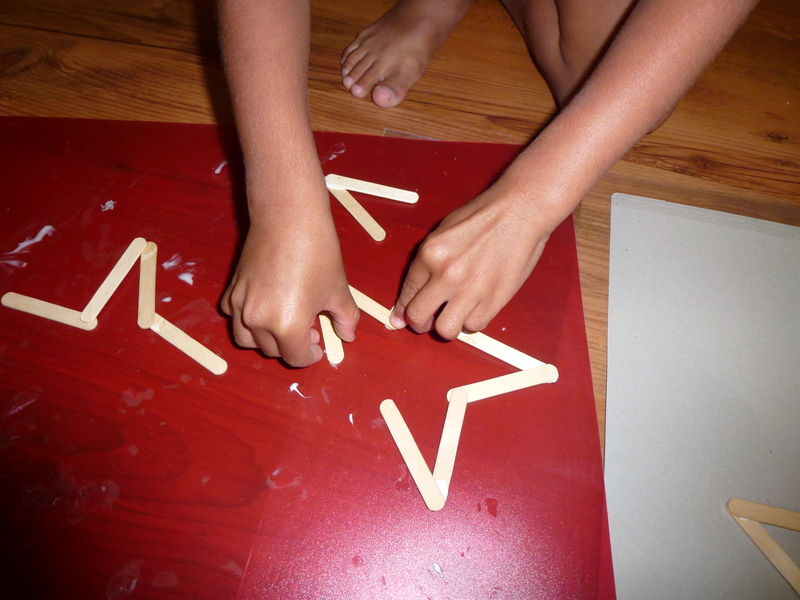 Pingback: Making popsicle stick stars – Ramadan « Art + Baja (aka Aunt) = Happy Zarah! Mashallah great! could u post the link where to find the crescent charms here ? I got the crescent charms over Ebay. Insha-Allah you should be able to search for them there. 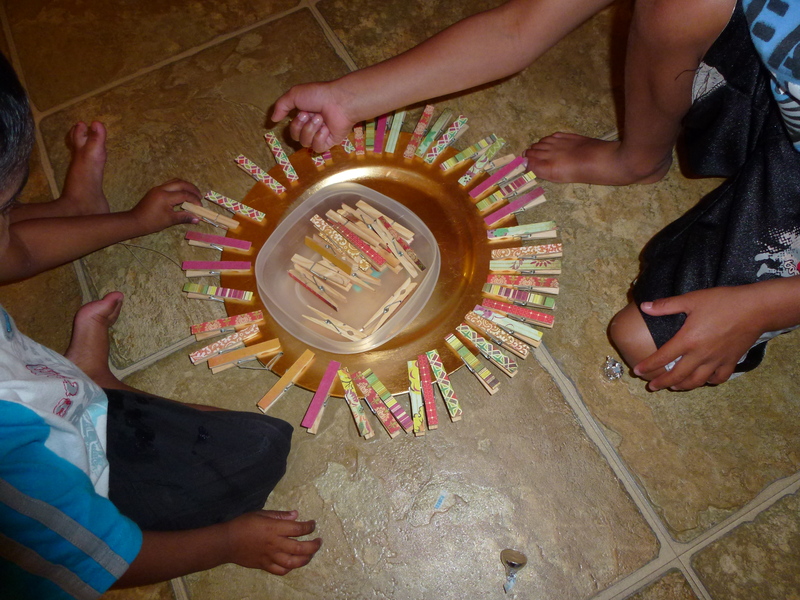 Pingback: Ramadan Craft 3 – Making popsicle stick stars – Ramadan « Art + Baja (aka Aunt) = Happy Zarah! Salam! Mashallah im really impressed by all the creativity of those kids..I would like you to tell me where did you get the plastic back written Eiid Mubarek.. It is just a charger plate, basically a plastic plate. 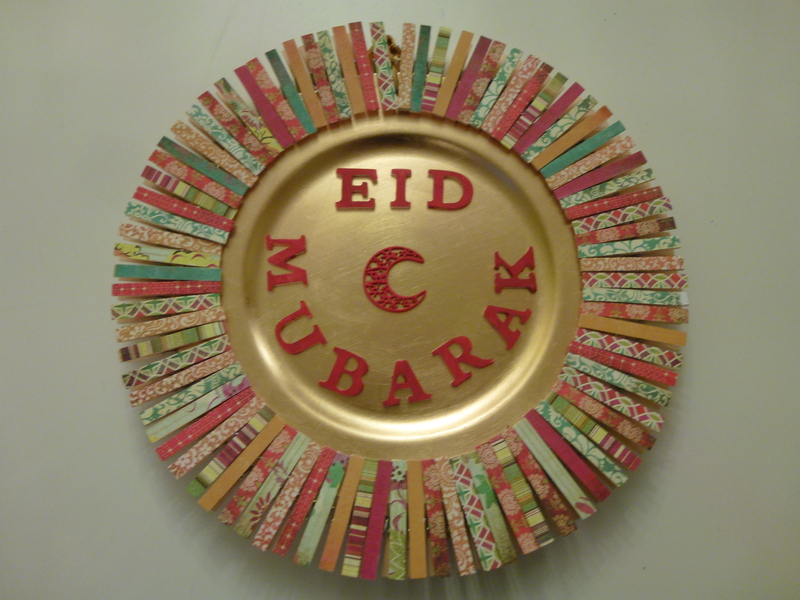 We glued some wooden letters onto it to spell Eid Mubarak. Hope this helps.